Yikes! Kim Kardashian Flour-Bombed on Red Carpet - Oh No They Didn't! What's worse: Being Ryan Seacrest and having fake ashes spilled on you at the Oscars or being Kim Kardashian and having someone flour-bomb you on the red carpet during an event? 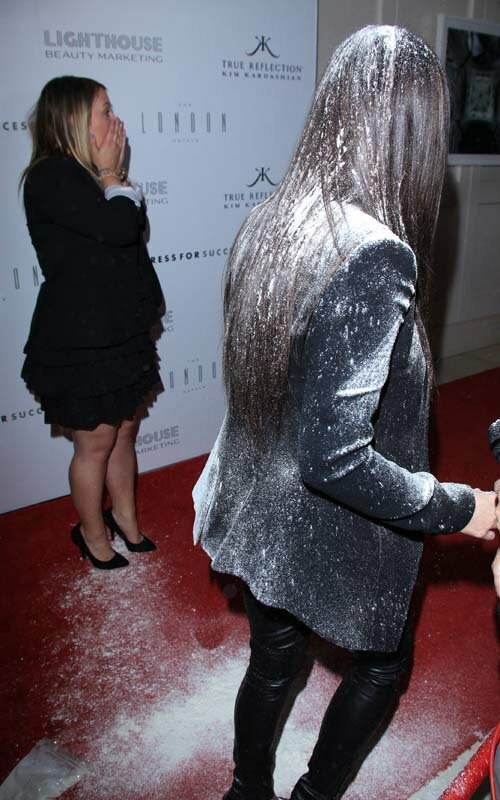 The reality star was doing interviews at a launch party held at the London Hotel in West Hollywood for her new fragrance True Reflection tonight, when—out of nowhere—a younger female fan (we guess you could call her that) threw an entire bag of flour on Kim. "That probably is the craziest, unexpected, weird thing that ever happened to me," Kim told us. "Like I said to my makeup artist, I wanted more powder and that's a whole lot of translucent powder right there," she said, laughing off the entire ordeal. Kris Jenner commented on the "festive" event, telling us, "If anybody comes at me with something, call security." The mystery woman tried to run away, but Kardashian's rep held her and security escorted her away. And like a lady, Kim walked away calmly, got cleaned up and returned back to the carpet about 10 minutes later. There's no exact reasoning as to why this woman did what she did, but some media members said they heard her saying something about fur (uh-oh). Regardless, everyone was cheering and applauding our Kimmy once she returned. What a good sport!